Want to sign up for more than one workshop? Select the Reservation option ($75) for your second workshop and you'll be all set!! Up until now, my deepsky image processing workshops have aimed at sharing specific techniques to solve particular problems we often find while processing astroimages. With this workshop series I am offering a different approach. Rather than showing how to solve isolated and specific problems, I will be processing one image from the beginning until the end, while I explain what I do, why and how. This not only should let you see how I take my data from raw to jpeg (the jpeg being what you've always seen and nothing else), but along the way it will provide you with countless hints, tips and ways to move forward with an image. 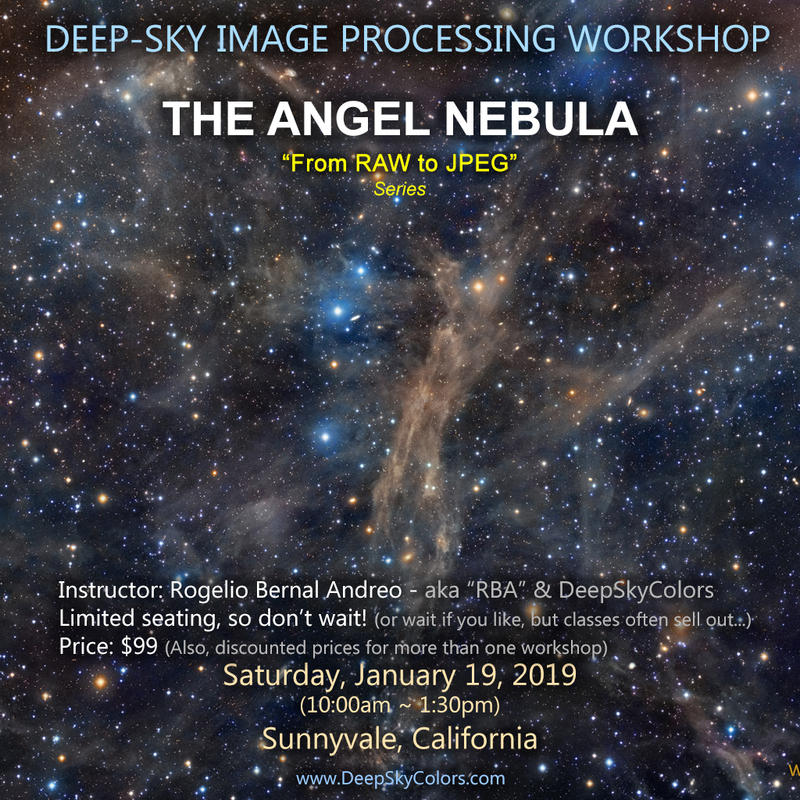 To make it even more interesting and challenging, for this workshop I will be processing from beginning to end one very interesting image: The Angel Nebula! Fully processing this image involves many challenging tasks, most particularly revealing extremely faint dust from the noise floor, advanced masking and layering techniques. This workshop is aimed at all levels, but particularly recommended to intermediate and advanced astroimage processors. Beginners might feel overwhelmed at the many processes, concepts and techniques used, but they will still be able to grasp a solid idea of the workflow and some bits that should help immensely in their future processing endeavors as they know the many ways they can go about taking their images where they want. There'll be a time for Q&A, so be prepared to come with your questions!! This is NOT a hands-on workshop. You can bring your own laptop but data files will not be provided. You definitely want to bring something to take notes, whether a tree-based notebook or a digital device! Rogelio has been all around the world doing astroimaging and giving talks and workshops about astronomical imaging and image processing: America (USA and Latin America), Australia, Europe, Asia... Click here for a list of awards and accolades. Just as Rogelio's work has often been defined as a unique, easily recognizable personal style, expect the same from his presentations, field trips and workshops.